And... Individuals can now license WordComplete for only $9.95! WordComplete adaptively predicts the word you are attempting to type and gives you a choice of options from it's dictionary. The original dictionary comes with a basic list of most commonly used words, then adds new words as you type them. You can also import or create multiple custom dictionaries to suit your needs. WordComplete also sorts the words in the dictionary by alphabetical and most often to least often used, so the more you use it, the more accurate it becomes. WordComplete is a program that monitors user input, and predicts words as the user types letters. As soon as you type a character, a small window appears which displays a list of possible words or phrases (Word Candidate list). The most frequently used words are displayed first. 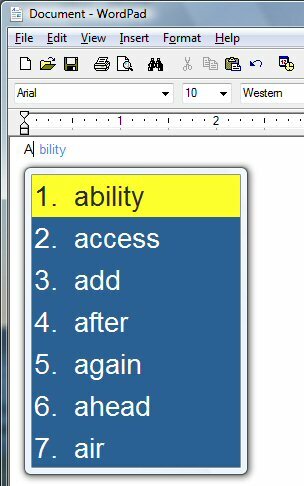 To further assist this process, an optional second window (inline window) can be displayed, and appears next to the letters that are typed. The inline window shows the most likely WordComplete candidate "inline" (i.e. shows the ending of the word). This visually helps the user see what their completed word would look like, using the most likely WordComplete candidate. Large Dictionary (more than 10000 words). 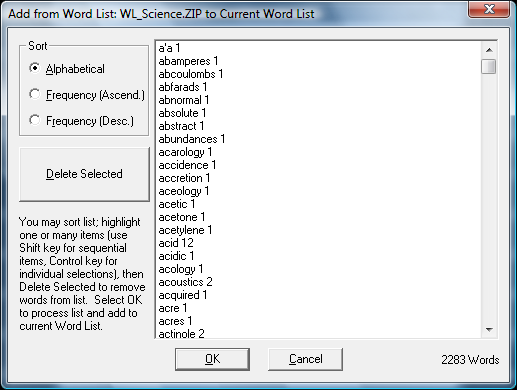 Expand or Create new dictionaries quickly and easily with the included Word List Assistant. Auto-Learns new words as you type. Can predict words and phrases. Easy interface for modifying existing dictionaries or creating new ones. Extremely customizable Word Completion candidate window (font, background, size, etc.). Displays inline most likely WordComplete candidate. 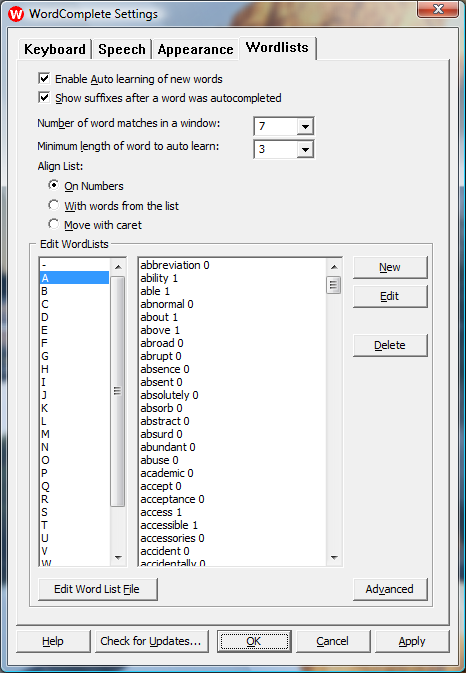 Choice of horizontal or vertical word list window. Select words with number keys (0-9), Enter, Space or Tab key. Automatic resizing based on how many words are predicted. Text-To-Speech capabilities (speak the selection, all words, or after word completion). 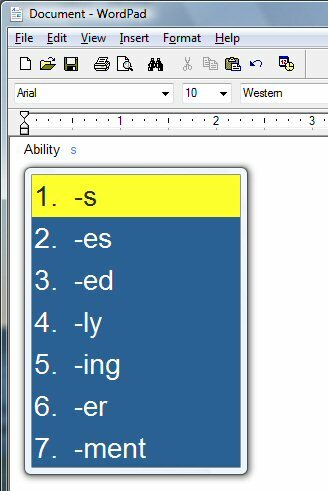 Easy to undo the auto completed word. Automatically adds a space after auto completing word, or after punctuation characters. Shorthand expressions (abbreviations) expansion support. Can be configured for "read-only" word list operation. Words can be added/deleted while in a document or manually in the assistant window. Words, text files, and entire web pages (html) can be imported by the List Assistant. Suffixes, entire sentences, and abbreviations with their expanded words/phrases can also be added. Text to speech can be enabled to apply verbal support. WordComplete is a standard Windows Application and does not require any special drivers, and should work with all keyboard and mouse emulation drivers that are compatible with the ones that ship with Microsoft Windows. WordComplete integrates with Microsoft Windows Active Accessibility to sense caret/text position within an application. Older applications may not provide full support for this capability, although any Windows 2000 or later properly written application should operate correctly. As always, IMG strongly recommends interested parties download and work with the software to verify it will work to their satisfaction in their environment/with their applications prior to committing to a purchase. Individuals may license WordComplete for only $9.95! WordComplete - Suggested Retail Price is US $99.95.